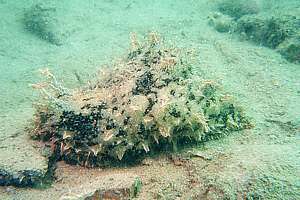 In May 2000, reports have been filed of invasions of sea hares, particularly the hairy sea hare (Bursatella glauca) in estuaries and sheltered coasts. Under the bridge in Torbay (Auckland, New Zealand), I found over 400 juveniles on less than ten square metres of sandy mud but, by the next day, they had all disappeared! The variable sea hare or black-tailed sea hare (Aplysia dactylomela) can now also be found in large numbers in rock pools and on sheltered coasts. It has been a year of uncommonly successful reproduction for these species, co-inciding with the peak in solar radiation during the 11-year sunspot cycle. See also the extensive section about our intertidal rocky shore, with 400 species photos. For NZ nudibranchs see images/seaslugs. Scientists and environmentalists can only guess at the causes of this population explosion. Other species such as snapper normally also experienced good recruitment of their young during years of warm water. 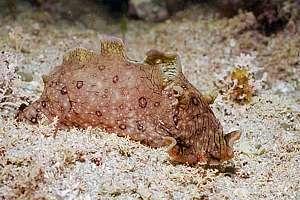 At offshore islands, such as the Poor Knights Islands, divers have observed an unusual variety of warm water fishes, never seen before in these waters. Variable sea hares have now appeared at the Poor Knights, where they are not normally found. The photo shows an unusually large one with an equally unusual reddish colour. During a period of calm weather, this large sea hare was found eating the green leaves of the sea lettuce, which grows close to the surface in a rather wave-washed zone (visible in the background). 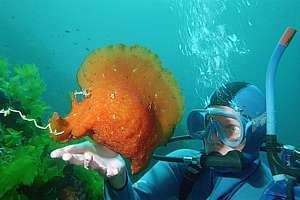 Its head has two large 'ears', hence its name sea hare. Its mouth is surrounded by sensory flaps. The yellow thread on the left of the photo, is a string of eggs. Two folds of skin or 'wings' extend upward from its football-shaped body. Between these wings it has the remnant of a hard shell, and its gills. 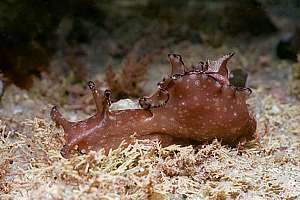 When threatened or when placed in unfavourable conditions, molluscs such as this sea hare, often start laying eggs. When threatened further, the sea hare can squirt copious amounts of purple ink by way of defence or decoy. Seldom living longer than a year, these animals can grow quickly because their bodies contain little substance. Whereas variable sea hares are solitary creatures, hairy sea hares are rather sociable. They spend their lives living close together in groups of three to twelve and it appears that they know each other well. At regular intervals they regroup, sniff each other like dogs do, and then come to a consensus decision to move on to a new grazing area. Like elephants, marching trunk to tail, they follow each other very closely. Hairy sea hares live from detritus, the dead bodies of plankton plants and animals, that have sunk to the soft bottom on which they graze. A population explosion of the hairy sea hares can therefore be linked to increased plankton blooms, possibly caused by increased sewage disposal. In recent times, also the parchment worm (Chaetopterus sp) has suddenly colonised vast areas of sea bed, where it was never seen before (See the article). One should be careful when making connections of effects to possible causes in the sea, because many sea creatures, unlike land creatures, lay tens of thousands or even millions of eggs each. The survival of their numerous offspring depends on many unknown and unmeasurable factors, which can result in years of either poor or excessive recruitment (A recruit is a young marine animal that survived its hazardous planktonic stage). 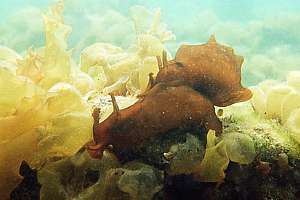 New Zealand has several species of sea hare that breed here. 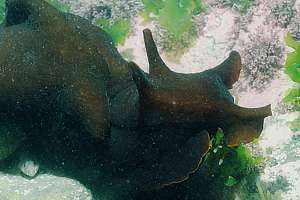 The variable sea hare or black-tailed sea hare Aplysia dactylomela is large and can be found in clean sheltered waters. Named after its dark 'tail', this species is more easily recognised by its distinctive floral pattern. f039207: the extraordinary seahare (Aplysia extraordinaria) is easily confused with the common seahare but lacks a floral skin pattern and black tail. It also stays smaller and is found in warm, sheltered clear waters in the north of NZ. It is one of the few seahares capable of swimming. f035525: the black seahare (Aplysia brunnea) is a large seahare, living in the cooler waters south of Wellington. A voracious feeder on sea lettuce, it can in some years be found in large numbers in the rock pools of Island Bay. f025909: the julian seahare (Aplysia juliana) is rather variable in colour, at times resembling any of the previous three seahares. But it is much smaller, preferring more exposed environments in clean water. f011622: the brown seahare (Aplysia keraudreni) is of medium size, smaller than the common seahare. It has a beautiful kelp-brown colour with pigment-less white speckles. Here they are seen grazing on pillow weed, while mating. In this manner these animals can form mating chains of more than two individuals. The animal's shell is relatively large and broadly oval. f040333: The little seahare Aplysia parvula occurs in a broad band of 40 degrees around the tropics and is common in northern New Zealand. It prefers to feed on red algae among which it is very well camouflaged. The animal is about 75mm in length, variable in colour, purplish dark brown or tan. The edge of its mantle is narrowly margined in alternate dark brown and grey. Its redish shell, which can clearly be seen in this picture, is horny and smooth. f005000: The photo shows a hairy sea hare (Bursatella glauca) crawling around over the mud, its normal habitat. Because of their disruptive colouring, they are often hard to see. The one in the background of this photo shows this. These sea hares live from licking the top layer of the mud, which is rich in dead diatoms that rain down from above. Hairy sea hares always appear to live in groups, congregating frequently 'to exchange news'. They seem to recognise and know each other and make decisions collectively, something which is usually found only in higher organisms like birds. Unlike the variable sea hare, the hairy sea hare has its wings (parapodia) fused into a tunnel by which some of its kind can propel themselves, squirting jets of water. It has no shell. Along its back it has two rows of emerald spots, each margined with a brown circle, from which it derives its name (glauca=blue). This species may be the same as B. leachii which is found throughout the Pacific. f025015: An unusually large orange sea hare (Aplysia sagamiana) was found at the Poor Knights Islands where they don't normally occur. Sea hares live from lush algae. Because they are so large, and cling weakly with their feet, they can survive only in calm waters, such as inside rock pools and on sheltered coasts. They normally live less than a year and can grow quickly because their bodies contain little substance. This sea hare has a thin shell, amber coloured outside and weakly glazed within. The white strings on the left of the picture are its egg mass. It started laying its eggs the moment it was handled. 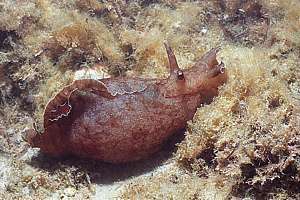 Sea hares, like most molluscs, are hermaphrodites, being both male and female at the same time. 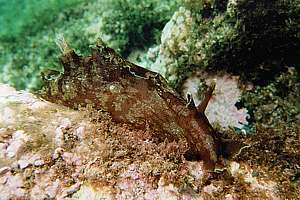 This sea hare is found from Japan to Australia in warm seas and in New Zealand perhaps only at the Poor Knights.